Boscote Cottage offers high quality self-catering holiday accommodation in the heart of Shakespeare's Stratford-Upon-Avon, just a couple of minutes walk from the centre of this wonderful town. Stratford offers excellent shopping in a beautiful setting, on the banks of the river Avon. The theatre and the Shakespearean historic houses are all walking distance from the cottage. There is also a rich selection of restaurants, pubs and cafes to choose from. Situated in Mulberry Street, Boscote Cottage is a pretty, newly renovated Victorian terraced cottage which has been stylishly refurbished to a very high standard. It is very well-equipped to ensure that your stay is comfortable and enjoyable. Boscote Cottage accommodates up to four people in a double bedroom (twin beds or super king size bed), single bedroom and quality, comfortable single sofa bed in the sitting room. With traditional flag-stone flooring, cosy rugs and open hearth the lounge is comfortably furnished and tastefully styled. 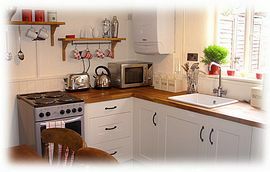 The kitchen is modern and well-equipped with cooker, fridge, microwave, washing machine, cutlery, china and glassware. The upstairs bathroom is stylish and offers bath with shower over and a constant supply of hot water. Bed linen and towels are provided. There is full gas central heating throughout. 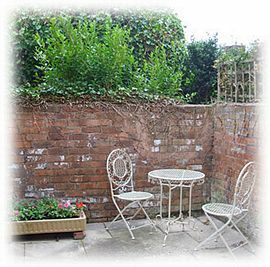 Outside, Boscote Cottage has a pretty courtyard garden complete with garden furniture and barbecue. It is a wonderful sun trap and allows you the opportunity to relax with a glass of wine in a secluded setting. We are happy to take children and pets by prior arrangement. A visitor's parking permit is provided free of charge for the duration of your stay. This must be returned at the end of your stay. Beautifully refurbished to a high standard. Pretty outdoor terrace - a real sun trap! Boscote Cottage is a strictly non-smoking property. Pretty outside terrace with table, chairs and BBQ. 4th January - 1st February £300.00. 1st February - 22nd February £420.00. 22nd February - 14th March £320.00. 14th March - 4th April £420.00. 4th April - 23rd May £395.00. 23rd May - 30th May £465.00. 30th May - 11th July £400.00. 11th July - 5th September £595.00. 5th September - 17th October £400.00. 17th October - 24th October £475.00. 24th October - 19th December £300.00. 19th December - 2nd January £595.00. Short break prices are 60% of the weekly price for 2 night stays and 75% of the weekly price for 3 night stays. 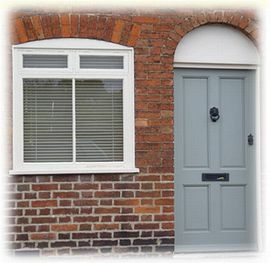 "Tastefully restored, well-appointed and perfectly situated" C&J Durham. "Thank you so much. Our stay at the cottage was amazing. It was a perfect little place with every comfort of home." Isaac, Dallas, Meri and Dana (Australia). 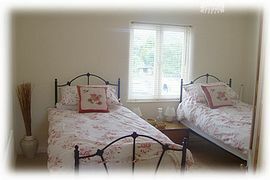 "Lovely place to visit, lovely cottage, well situated" D&M South Wales "Enjoyed our short stay. Ideally situated. 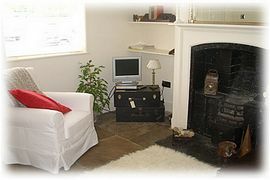 The cottage was lovely and very comfortanble" D&D, Herts.